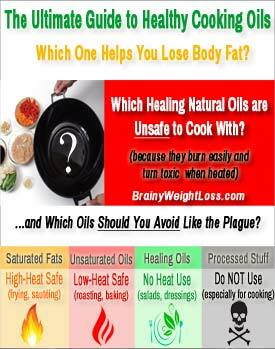 Healthy Cooking Oils: Which One Burns Body Fat? Which Healing Natural Oils are Unsafe to Cook With? If you are like most people, you’ve probably been told that “all fats are bad” and you should stay away from any fats and oils – especially when you try to lose weight, right? Thankfully, times have changed, so get ready for some good news! You’ll discover here which of the healthy cooking oils is actually making you lose fat, which healing natural oils aren’t safe for cooking and which oils you should avoid at all costs – and why. And to give you as much useful details and practical tips as possible without overwhelming you, this topic is split in several articles that you’ll find listed at the end of this page. This way, instead of having to read volumes written on the topic of fat science and trying to make sense of the scientific jargon, you can focus only on the specific info on healthy cooking fats and healing natural oils that you’re interested in – in plain English. For your convenience, I’ve made a handy chart with several types of cooking fats and healthy cooking oils – you’ll find the actual size version at the end of this page – make sure to use it! Let’s dive in and see why everything you thought you knew about cooking oils is wrong. Over the last few decades health officials have claimed that vegetable saturated fats like coconut oil and palm oil are bad for you and can cause heart disease. But recent evaluation of the basis for this recommendation has found it to be completely flawed. Because those early studies used hydrogenated or refined oils (hydrogenating and refining oils is what makes them oxidized and harmful for our health). The reality is that unprocessed saturated fats are beneficial to our health. Instead of avoiding them, you should allow them back in your diet and even consume regularly some of the healthiest, like coconut oil – more about this in a moment. Here’s just one of the many ways truth is finally told – a confirmation that the “fat-free” mantra is over and the recommendation for cooking with vegetable oils is officially outdated. For years, we’ve been led to believe that refined vegetable oils like soybean oil, sunflower oil, corn oil, safflower oil, canola oil were better to cook with than butter, lard, and saturated fats from coconut and palm. common supermarket vegetable oils like corn, sunflower, soybean, canola, safflower, are a massive health risk. Well, simply because these cheap, highly processed oils filling the shelves of every supermarket become very unstable when heated and quickly become oxidized. The oxidation of their fatty acids content produces a massive amount of free radicals and toxic chemicals like aldehyde. When consumed regularly, these compromised oils impact everything in your body, from cell membranes, to blood vessels, to DNA/RNA strands and this damage results in an increased risk of developing cancer, cardiovascular disease, liver damage, type 2 diabetes, premature aging, dementia, immune dysfunction, among others. So don’t feel guilty any longer when you have some butter, full-fat milk, cream, a regular (vs. “fat-free”) dressing or a creamy dessert! In fact, moderate amounts of certain types of fats and healing natural oils are vital not only for your health, but help you lose weight as well. However, you should know that not all of these healthy oils are suitable to cook with. That’s because higher temperatures burn (oxidize) some oils quicker than others, destroying their molecular structure and creating those harmful compounds mentioned before. So naturally, you want to use safe cooking oils, which in addition to remaining stable at higher temperatures, aren’t already spoiled by industrial processing and refining, becoming downright harmful, bad cooking fats before you even pick them up at your supermarket. Well, despite the last decades’ propaganda for industrially refined vegetable oils and against saturated fats, the latter are proven by recent clinical studies to be among the most safe and healthy cooking oils. That’s because the higher an oil is in saturated fat the higher the temperature and time it takes to become rancid (oxidized). Ideally, the dairy and animal fats should be from pasture-raised, grass-fed, organic sources because all toxins, antibiotics and other medication used in industrial farming concentrate in this fat. Because dairy and animal fats are more easily stored as body fat, it’s better to limit their use. Plus, saturated animal fats from pasture-raised, grass-fed, organic sources are also harder to find and more expensive. But coconut oil is particularly healthy to cook with. It stands out as the safest and healthiest cooking oil, which shouldn’t be missing from your kitchen. Because coconut oil resists amazingly well to the highest cooking temperatures and does NOT create any oxidized toxic particles harmful for your body. When it comes to cooking (and not only), coconut oil is the safest among all other healthy cooking oils. Did you know that coconut oil actually makes you burn more fat? Well, coconut’s oil weight loss benefits are well-documented. Besides these fat-burning benefits, coconut oil has many other health benefits and this makes it one of the best healing natural oils. For example, regular consumption of coconut oil lowers cholesterol, normalizes blood pressure, improves thyroid function, helps prevent disease and boosts energy – to name just a few. Also, coconut oil’s high MCT (Medium Chain Triglycerides) content makes it exceptionally good for your brain. In fact, people who feel like they’ve lost their mojo and want it back in a healthy way, simply love coconut oil. So whenever you need fat to fry, bake, or sauté with, use coconut oil instead of any other vegetable oils or – even worse – synthetic margarines and shortenings, which are a definite no-no! And if you insist on making a deep-fried dish, use coconut oil too. In fact, the finger-licking deep fried coconut shrimps are one of our top coconut oil recipes. Not only is cooking with coconut oil very healthy, it is convenient too. When you are done deep-frying and the oil is still liquid, filter it into a jar and save it up to a year, it will still be good. Plus, high quality coconut oil is quite affordable and easy to find at your local Wholefoods, health food store or (even cheaper) at Amazon. It’s true, there’s a lot of talk about the benefits of unsaturated oils but not all live up to the hype. Certain unsaturated oils like macadamia nut oil, olive oil, almond oil and avocado oil have an incredible healing power. It’s best to buy organic, cold-pressed, extra-virgin unsaturated oils – unless you’re going to cook with them, in which case it doesn’t make sense to pay extra for the cold-pressed variety. But what about flaxseed oil, one of the best healing natural oils, you ask? Well, flaxseed oil is not only heart-friendly and a great help in losing weight, but an excellent idea for using in salads, dressings and any kind of shakes or smoothies – you may want to take a look at the health benefits of flaxseed oil. And the same applies to the other healing natural oils rich in essential fatty acids, like hemp seed, chia seed and walnut oils. Drizzle small amounts for a delicious, dense aroma to your stir-fries – but only AFTER you’ve removed the wok from the heat – or use them to flavor any cold dishes like dips, veggie or fruit salads. These healing oils help you lose body fat easier and are a delicious way to avoid an essential fatty acids deficiency. But always remember to never, EVER use flax seed oil, hemp seed oil, chia seed oil and walnut oil for cooking! Why? Because these delicate oils get completely destroyed as soon as you heat them, becoming a risk for your health. Please share this crucial information with people you care about because the health damages caused by unknowingly using harmful oils are devastating!